“Canadian flax seed has been shut out of its largest market after traces of Triffid — a genetically modified form of the crop ordered destroyed 10 years ago — was found in shipments. The European Union, which buys 70 per cent of Canada’s flax, has a zero-tolerance policy regarding genetically modified organisms and has been turning away shipments. Oct. 15 (NaturalNews) Since the Flax Council of Canada (FCC) first announced that genetically modified (GM) flaxseed not approved for human consumption had been detected in Europe, reports of such contamination have surfaced in a total of 35 countries. 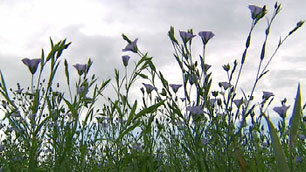 The variety of flax detected is known as FP967 or Triffid, and was never approved for commercial use. In 2001, the Canadian government banned its use. Researchers are still unsure how commercial flax stocks around the world have become so widely contaminated by Triffid’s genetic material. What is known is that by 2001, 40 different seed producers were growing 20,000 bushels of Triffid seed, anticipating future demand. When the GM crop was banned, the stocks were supposed to be destroyed. Some investigators suspect that instead, much of it was put into production anyway. Others have pointed the finger at the sample seed packets distributed to farmers in 2000. Although such packets were not intended for commercial use, some farmers may nevertheless have planted and eventually commercialized them. Alternatively, genetic contamination of non-GM flax could have taken place during Triffid’s testing phases, before it was banned and without widescale commercial planting. The FCC has been criticized for covering up its knowledge of the genetic contamination for months until its announcement in September 2009 that Triffid genetic material had been detected in Canadian flax being imported into the European Union. The FCC admits that it first learned of the contamination in July, but an anonymous industry source informed “The Organic & Non-GMO Report” that the FCC actually learned of the contamination in March. Genetic ID is endorsed by the Canadian Grain Commission as equipped to test flaxseed samples. Sources for this story include: http://www.organicconsumers.org/art….